The sunrise is golden with a few wisps of pink clouds over the ridge line. As the dew evaporates in the summer morning, I anoint my brow with the oils of saffron and cedar and frankincense. Barefoot and bare headed and silent, I pour out fresh milk and honey in front of the rosebushes. I inhale their scent– spicy and floral with a bit of citrus– and carefully use the curved knife to harvest the heirloom field roses and sprays of soft pink Victorian climbing roses, the richly-scented damask roses, and the golden yellow musk roses. I place the blossoms gently in the tincturing vessel and the potion begins. We’ve been using Tincture of Roses for a few years now and are planning to add it to the shop this summer. No simple love philtre, this. 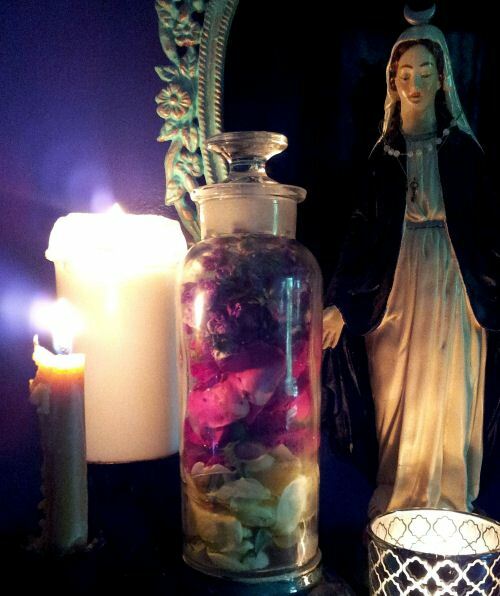 Rose tincture is added to the sabbat wine to strengthen the bonds between the company of witches, both those in body and in spirit, as well as with tutelary spirits of the group. It may also be used for a period of time to fortify and balance the aetheric body in preparation for works of dreaming, faring forth and spirit contact. Finally, a few drops placed in the mouth before summoning assists in compelling spirits and lends cunning power to the voice of invocation.